Manfrotto offers a truly unique item in their Autopole. Designed to go from floor to ceiling for a secure support without legs. A sturdy locking system utilizes a cantilever single action locking system that exerts pressure to securely wedge the rubber suction cup ends in place. The cantilever system incorporates a safety lock and quickly and securely locks the pole in seconds. Create background supports, a lighting grid, or hundreds of other studio applications. Extends from 82.7- Inch to 145.7- Inch. 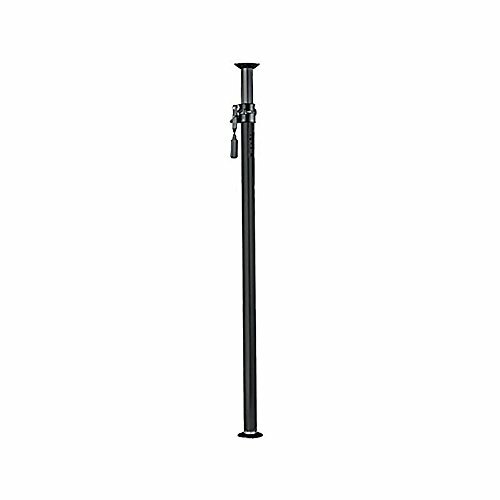 Pole Degree: 45 and 40mm.A base is available for those times when the ceiling is too high. Great for backgrounds and other support applications , This replaces the Manfrotto 2956S. Color: black; material: aluminum; maximum extension: 145.67 in. ; minimum extension: 82.68 in. ; pole diameter: 45.40mm. ; weight: 4.85 lbs. Unique locking system is secure and quick.